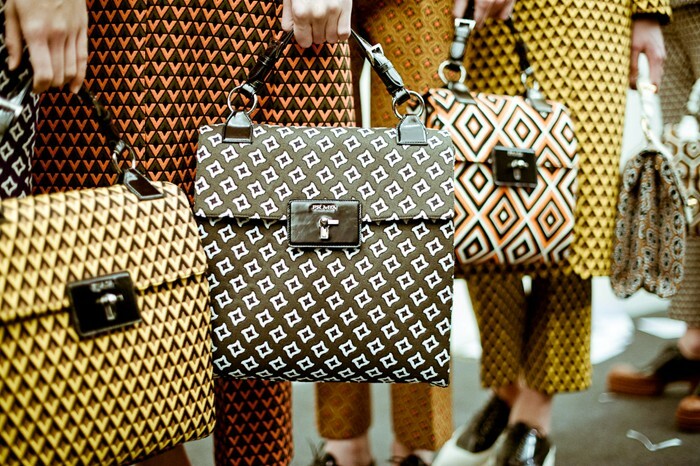 Prada’s autumn/winter grannyesque, 60’s and 70’s inspired prints are going to be everywhere this season my Shoelets – EVERYWHERE! There will be rip-offs galore incorporated into trouser suits, dresses, bags and no doubt even faces. I’m already thinking about getting that second bag from the left tattooed onto my eyelids. However, come February we will be sick of the sight of print and we shall be craving the calm, soothing sight of neutrals and block colours. I, for one, can not wait for the onslaught of pattern and colour. I am a lover of print and although, in the last couple of years, those plain hues and simpler outfits have become appealing I always return to the print. She is my friend and is worthy of my attention. This ancient Maggie by Zakee Shariff jersey dress is an oldy but a goody and when the sun is shining, the body has a little colour and London Fashion week is here she deserves a showcasing. What do you think of the onslaught of print we’re going to be having? Are you scared of it? Do you feel you can wear it? With Prada’s inspiration being taken from past decades are we cheating? Has it all been done and should it be left where it was or is it right for a revival? Let me know your torts and we’ll get through this print period together….. I totally agree. When you want to hide a print can be a great distraction. I personally feel the Prada print is a little too much and can definitely lead to the lamb dressed as mutton syndrome;) Love that you’d be up for trying it though!